WASHINGTON, DC--(Marketwired - Oct 5, 2015) - Organic & Natural Health Association (Organic & Natural) has released the results of a consumer research study conducted as a first step in their initiative to set the standard for the term "natural." The online research study of 1,005 U.S. consumers was conducted by Natural Marketing Institute (NMI) and found that 1 in 3 consumers do not make a quality distinction between the terms "natural" and "organic" and/or government regulation for products with such labels. Other findings from the study confirmed more confusion in the marketplace with the term "natural." Common misconceptions include the belief that most vitamins come from natural sources and that "natural" means no pesticides are used. And while three-fourths of consumers perceive that organic foods must be at least 95 percent free from synthetic additives, almost two-thirds of consumers expect the same standard from "natural" foods. Further, approximately half of the consumers surveyed believe that "natural" means the product is free of synthetic pesticides and are non-GMO, attributes that are unique characteristics of organic products. With 46 percent of consumers surveyed believing that the U.S. government regulates the term "natural," the study concluded that the organic industry should improve education for consumers regarding the differing attributes of organic and natural in order to elevate the status of organic. Furthermore, manufacturers producing natural products need to continue to clarify the meaning of natural so the term does not become diluted and lose significance among consumers. In the research study, consumers indicated that they were more likely to use "natural" than "organic" foods; in fact, 60 percent reported using organic less than once a week or not at all with more than a third using natural once a day or more. When it comes to meats labeled as "natural," attributes of "no-added growth hormones" and "antibiotic-free" were of primary importance to consumers. "The overarching intent of this survey is to improve access to quality organic and truly natural food, products and services," said Karen Howard, CEO and executive director of Organic & Natural. "Our goal is to support increased access through consumer research and education and we are now embarking on the development of a program that will create a clear, meaningful definition for natural foods, followed by a definition for natural supplements." Howard said based on study results Organic & Natural will require the definition of natural, like organic, to translate into 95 percent of all ingredients qualifying as such, with explicit definition of ingredients qualifying for the 5 percent exclusion. In the case of fortified food and dietary supplements, synthetic vitamins will qualify for the exclusion with the exception of synthetic vitamin E and D. Organic & Natural's definition of "natural" will be comparable to the definition of "organic," requiring that all natural labeled food be non-GMO and not contain artificial preservatives, colors, flavoring or sweeteners, but in some cases there will be additional criteria beyond organic standards. For example, beef will be held to organic standards and must be grass-fed and pastured to earn a natural designation. They will also promote quality standards for organic and natural by endorsing the ancillary certifications upon which consumers currently rely upon, including non-GMO and grass-fed beef. When it comes to traceability, which directly relates to quality, Organic & Natural is taking a value-added approach, accepting documentation from recognized, demonstrated effective, seals and programs. This includes documentation of each company's supply chain, including monitoring and testing of raw ingredients. In addition, they are partnering with a new analytical research and testing laboratory that will help to better understand and communicate adulteration, contamination, pesticide residues and identify potency for foods, agriculture and to measure parameters for health. Organic & Natural's next step is to develop a voluntary regulatory compliance and certification program for the term "natural" to be released during the first half of 2016, in conjunction with a consumer education campaign supporting transparency of product purchases. 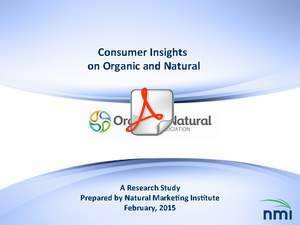 To view the complete study, "Consumer Insights on Organic and Natural" visit: http://www.organicandnatural.org.